Anyone have a list of Walker damage/health pre-2.5 vs post 2.5? 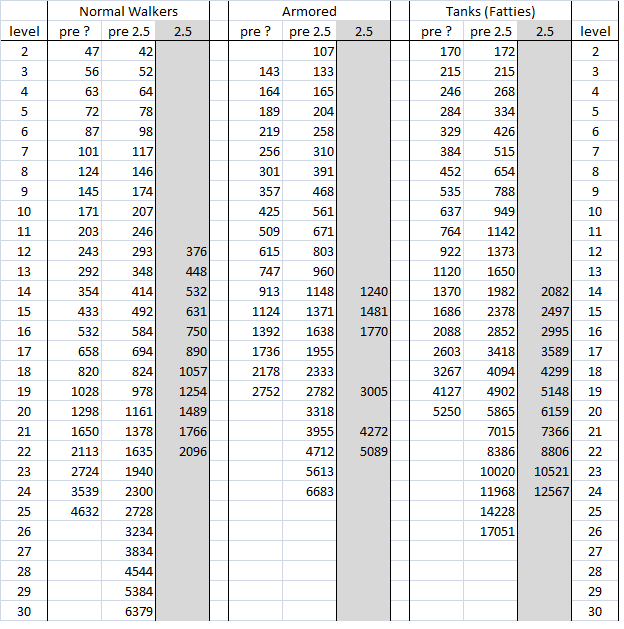 I'm surprised the number-people here haven't posted a chart comparing Walkers at each level (and each type; normal, armored, heavy) from before and after the buff. 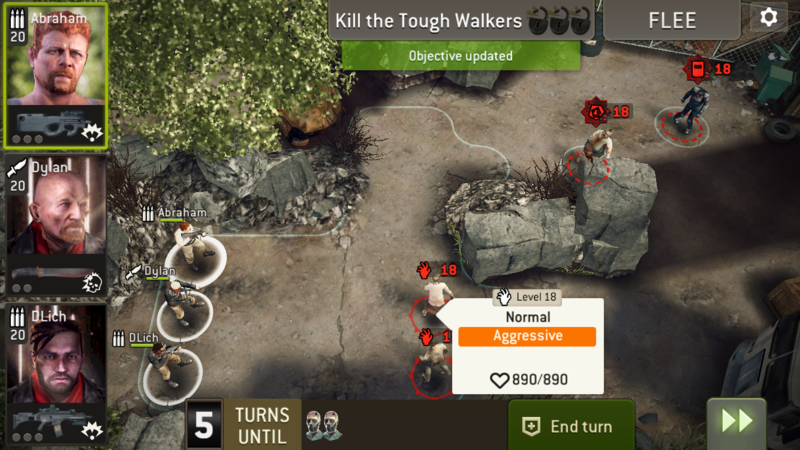 Did anyone record the Walker stats (from, say, levels 15-30) before the update? Oh wait, were you looking for actual numbers? Sorry, can't help you there. @JayZ At least your stats are accurate. This was accurate as of the moment walkers started giving xp around update 2.0ish I think. I forgot I had this until I saw this thread. I built it on my own playing challenges in the old style and was given the info for higher walkers as at the time I was nowhere near able to get that high. It's outdated and hasn't been updated in a while but it's accurate. So here are the pre 2.3 numbers. I should add. 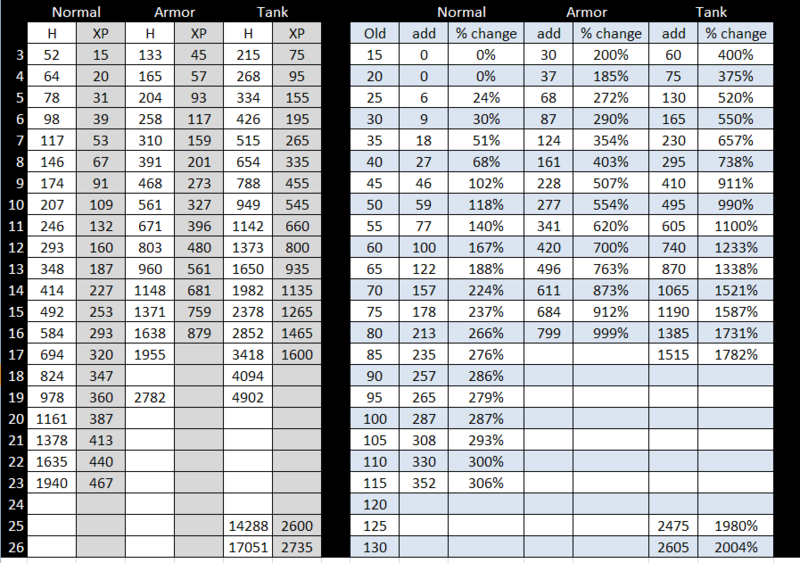 That chart shows the additional XP compared old to new. Many new players might not remember but XP was linear regardless of type. A Lvl 3 normal, armored or fattie all gave 15 XP. Lvl 15 gave 75 XP. Looks like normal went up. But it could have gone up some other upgrade. Again that spreadsheet above is around 2.2 version. Here's data on walker health I collected. Health only, no XP data shown. The first column of each walker type (pre ?) is an even older set of data. The second column (pre 2.5) seems to match Dlich's table. I briefly tried looking through the announcements to figure out which updates included walker health changes. I found a mention of such in update 1.10 (July 2016), but I have no idea if that corresponds to one of the columns.